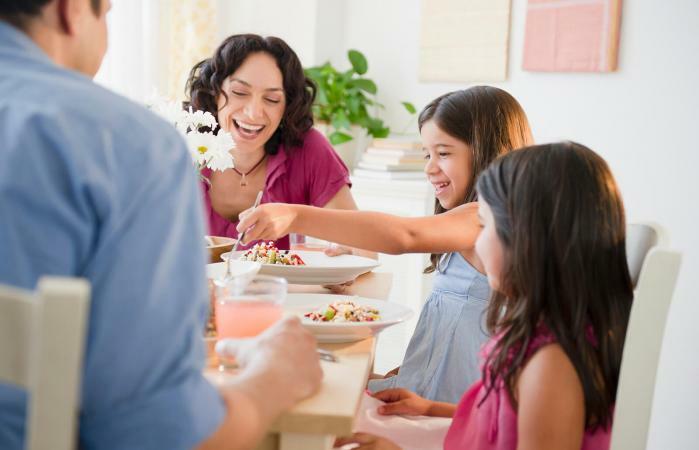 Family dinners can promote bonding and foster close relationships. However, keeping kids' attention may be a challenge. To keep your kids at the table, try a family dinner game that is sure to help create laughter and memories for all. When kids are learning their letters and translating them into the ability to read, it can be really fun for them to foster their love of everything alphabetical by playing letter games at the table. Not only that, but it helps keep their focus while you share a family meal. Choose a letter. You can start with "A" and work your way through the alphabet, or choose one at random. Challenge each family member to find something in the room that begins with that letter. The winner of each round is the person who finds an answer first. Building your vocabulary while enjoying your meal can be a fun dinner game for kids. The sillier the words that kids can come up with the more fun. And if you can think of some big and interesting words, you can really help to build your kid's vocabulary through learning games. Start by picking a food that was made for dinner, say mashed potatoes. Go around the table until you can't think of any more words to describe the food. Silly descriptors can really get everyone laughing. Table games for kids should be fun for the whole family like this one is. There's no doubt that everyone has parts of the day that were good and parts that weren't so great. Because kids love to share, this is a fun game to get everyone talking and sharing. It's also a great way for the entire family to show empathy to the others and it's sure to get you laughing at times too. Let each person tell something funny or exciting that happened during the day. Have each person talk about something that wasn't good. Then go back to the funny stuff. You'll sandwich the bad between the good and have everyone feeling good at the end of the meal. This is a fun kids' dinner table game for all ages and gives your kids some problem-solving skills, even though they probably won't realize it. It's easier to play if you serve your dinners family style at the table rather than at the counter. Kids love nothing more than putting one over on Mom and Dad, so this is an easy and fun way to let them do just that. There can be a winner for each round of this game. Have one person close his eyes. All the other players remove something from the table. A napkin, salt shaker, fork or dinner roll are all great ideas. The player opens his eyes and must guess what each person removed. The winner is the player who removes the items that can't be guessed. Fun, learning activities while at the dinner table can make for great family bonding. Another way to help kids to build their vocabulary and have some silly fun with your family is through rhyming words. This can be really useful if kids are just working on this skill at school but can be fun for older kids as well. Start with something on your dinner plate like meat. Have kids think of a word that rhymes with meat like feet, peet, etc. You can even use made up silly words for little kids. For older kids, give them a time limit to add more of a challenge. Go around the table until they can't think of any more words. The best wordsmith could get extra dessert or more TV time. There's no doubt that these dinner games will get your family laughing and loving meal time. You have to eat, so you might as well make it beneficial for your entire family. By enjoying some games at the table, you can effectively get your kids to stay nearby and have some fun with you. Don't stop with these games. You can modify them or even let your kids make up new games. You can even keep the fun going on a family picnic.